← Does the Virgin Birth matter to you? In our last study, I mentioned a common misconception many Christians have about the Virgin Birth. They think it was by being born of a Virgin that Jesus was kept from inheriting our sinful human nature. If you haven’t read that lesson, please take a few moments to do so. You can find it just below this one. Now, in this short study, I want to explain the first reason Jesus had to be Virgin Born. Two facts are obvious. A human Savior would crush the work of Satan while suffering in the process. But the second fact is equally gracious. Though it was the woman who first opened the door to the devil, it would be through the seed of the woman that mankind would one day be saved. Notice! No mention of the man’s seed is made. This is the first hint in Scripture of the Savior’s Virgin Birth. But that raises a question: With so many people having been born into the world, how would we who need a Savior recognize Him if He came? Even if the estimate of the Population Reference Bureau is inflated, it is clear that billions of souls have been born into this world. For example, today we are told that there are over 7 billion people living on earth. 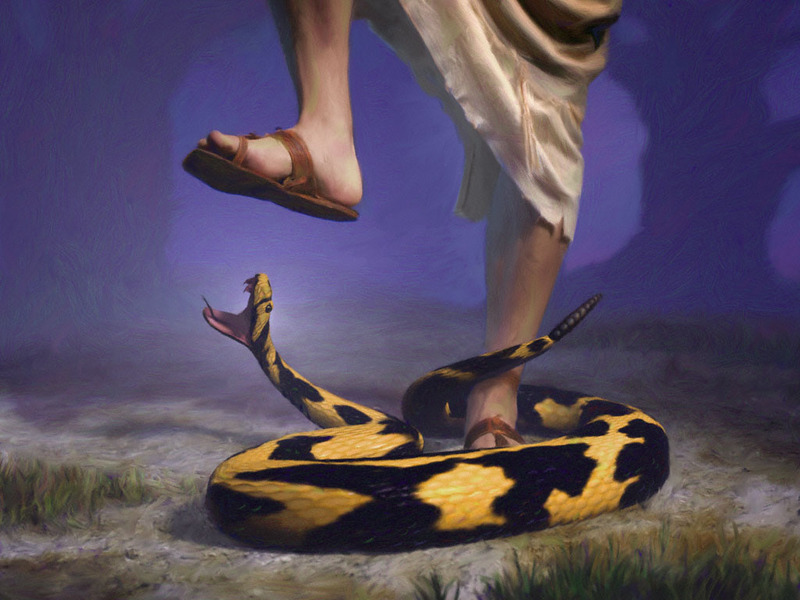 And you can be sure the same serpent who deceived Eve would love to deceive us into believing in the wrong one. To make it clear who the Savior is, God came up with a foolproof plan. He chose a man named Abraham and his family (called the Hebrews or Jews), gave them His moral law, entrusted His promises to them in a sacred book called the Bible, and after hundreds of years of using them to prepare the world for His coming, He sent us His Son, the long-awaited Savior through the womb of a Jewish virgin by the name of Mary. Over 60 major prophecies were fulfilled at the first coming of Jesus, many of which were beyond His control. For example, Genesis 12:1-3, 2 Samuel 7:12-13, and Micah 5:2 said He would be a descendant of Abraham and David and be born in Bethlehem, a little town 6.2 miles south of Jerusalem. This is a prophecy which has been continually attacked by critics of the Bible. They argue that the Hebrew word for “virgin” (almah) can mean young woman instead of virgin. But this is quickly corrected if you consult the Septuagint, the Greek translation of the Hebrew Bible made 200 years before the birth of Christ. For the Greek word chosen by the Hebrew scholars to translate almah is parthenos which is only used to describe a virgin, that is, a young woman who has never had sexual relations with a man. But what seals the deal and ends all argument is the fulfillment of this prophecy described by the Apostle Matthew. Four times in five verses, he assures us that Mary was a virgin, that no man was involved in the birth of Jesus, but that He was conceived by a miracle of the Holy Spirit. I have underlined the key phrases. Why, then, is the Virgin Birth important? It proves beyond a reasonable doubt that the one and only Savior of the world is Jesus born, as the Bible promised, to a virgin named Mary two thousand years ago in the little town of Bethlehem. What was the lie told following His resurrection? Matthew 28:11-15 records it. In order to keep the people from believing in Jesus, the chief priests and elders bribed the Roman soldiers who guarded His tomb to say that His disciples came by night and stole His body while they slept. How implausible! Roman soldiers risking the death penalty by sleeping on guard duty? And twelve cowardly disciples able to overpower a squad of seasoned soldiers? But people believe what they want to believe. If you are willing to accept the Virgin Birth of Christ, there is more than enough evidence to rely on. But if you have made up your mind that you do not want to believe, the devil will be glad to plant enough doubts in your mind that you will find it difficult if not impossible to believe. Don’t let him do that to you! After all, what is left to those who reject the Virgin Birth of Jesus? Nothing! No forgiveness of sins and no assurance of salvation! For if Jesus is not Messiah, no one is. Only He has the credentials to be Savior of the world. The Apostle Paul offers this assurance in Galatians 4:4. Reread the passages I have cited and be fully assured. Jesus is the one and only Savior to whom you can turn this very moment to forgive your sins, to comfort your heart, and to answer your prayers. Bible prophecy assures us of it. That is the first reason the Virgin Birth matters. In our next study we’ll take a look at a second and even more important reason. This entry was posted in Uncategorized and tagged Bethlehem, Bible, Emmanuel, forgiveness, Gabriel, Jesus, Jews, Mary, population, salvation, Savior, serpent, Virgin Birth. Bookmark the permalink. Thanks, Joanie! We will pray. One more study to go. Merry Christmas! God bless you!